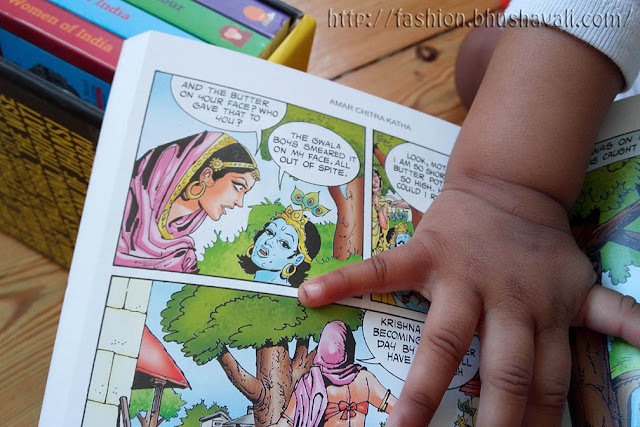 Story Time with Amar Chitra Katha! The problem with the upcoming generation is that, many in our generation are far from our family, making it difficult for the kids to be exposed to our cultural and historical stories, unless & until we tell them, or.... YouTube does it! I thought it would be a good idea to show kids YouTube videos but then my pediatrician clearly told me not to expose the kids to TV until 3 yrs and not to hand them consoles until 6 yrs old! For babies till 3, a video on TV or computer, even if educational, doesn't mean anything except 'fast moving bright images', which slows down their brain development and damages eyesight early!!!!! So finally, Atyudarini has to be exposed to the stories through me and her dad and it has to come orally without the aid of computer. But without a visual media to keep her attention, it isn't easy! Also, though I do remember Ramayana, I don't remember every character and every sub stories. I remember just the outline and main characters. Here's a self conversation: Name a woman who fought in Indian freedom struggle? Yeah, I know that - Jhansi Rani Lakshmi Bhai. Ok, now tell her story. Errrmmmmm........ You see, I need a refresher course to be able to tell them to Atyu and I need a visual media to keep her attention - it has to be books! And the next thing I thought was Amar Chitra Katha. When was the last time I thought of Amar Chitra Katha? Probably in my high school days. I haven't bothered to look into the publication after that and wasn't even sure if it existed. I browsed to see what is available and a surprise awaited me! They exist very much and are alive and awesome. They have a very functional website. Their book titles have grown a lot. Best part - they ship worldwide. Apart from these huge combos that has 20 to 70 topics in them, there are several small combos of 3-5 topics like Stories of Shiva, Tales of Revolutionaries, Dasavathara etc. Then ofcourse, all of their topics are available as individual books right from Bhagat Singh to Jataka Tales to Krishna Leela etc. On a different note, if you're a group or association or library you might want to look at their Ultimate Collection of all topics! Btw, what was the first princess story that you told your daughter? In our case, it was, no prizes for guessing, Jhansi Rani Lakshmi Bhai. She was a queen! Well, she was a princess, before she became a queen. Btw, that's Atyu's dad brushing up his story before he told it to her.... Isn't it high time we stopped telling those princess stories where she is rescued by the handsome prince?!!!! It is cool that there are still publishers for this kind of books. Worth reading!